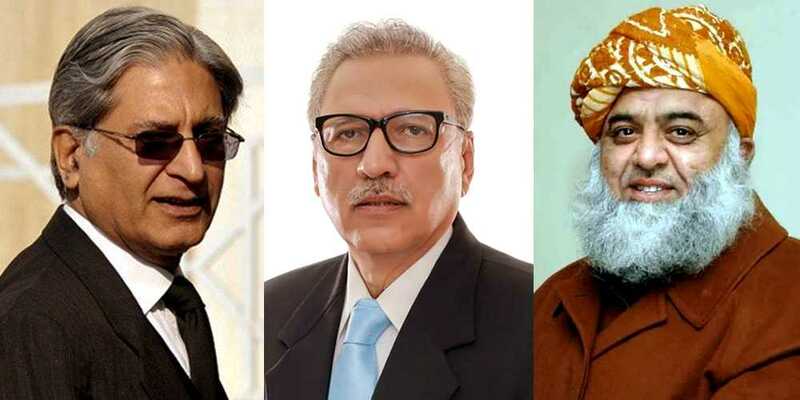 ISLAMABAD: The Election Commission of Pakistan (ECP) on Wednesday approved the nomination papers submitted by Pakistan Tehreek-e-Insaf’s (PTI) Dr Arif Alvi, Pakistan People’s Party’s (PPP) Aitzaz Ahsan and Muttahida Majlis-e-Amal’s (MMA) Maulana Fazlur Rehman for the presidential election scheduled on Sept 4, as all three candidates have started lobbying for support of political parties. While the PTI nominee for the presidential race, Dr Arif Alvi, is confident of an easy victory, PPP candidate Aitzaz Ahsan said he hopes that Jamiat Ulema-e-Islam-Fazl (JUI-F) chief Maulana Fazlur Rahman will withdraw his candidature after failed negotiations with the Pakistan Muslim League-Nawaz (PML-N). Unable to tackle the ruling party with a joint candidate, the opposition parties stand divided between Aitzaz and Fazl in the presidential election due on September 4. “Voters have to decide this and I hope some PTI leaders will also vote for me,” he added. On the other hand, Maulana Fazl met with Grand Democratic Alliance (GDA) chief Pir Pagara in Karachi and sought his group’s support for the presidential election. Later, talking to reporters, Fazl admitted that both PPP and PML-N could not reach a consensus for a joint candidate for the race. He said that he would not have any objection if both parties decide to support Aitzaz. MMA Spokesperson Allama Owais Noorani said that the JUI-F chief will also hold meetings with MQM-P leaders, including Khalid Maqbool Siddiqui. Meanwhile, Balochistan Awami Party (BAP) has announced to support Dr Arif Alvi. This decision was announced in a joint press conference at Chief Minister House, after a meeting between PTI’s presidential candidate Dr Arif Alvi, Federal Minister for Defence Pervez Khattak, PTI’s senior member Jahangir Tareen, National Assembly Deputy Speaker Qasim Khan Suri and Chief Minister Jam Kamal. Balochistan Chief Minister Jam Kamal while talking to media, said that BAP would fully support PTI at the federal level for resolution of Balochistan’s problems to bring real change in the province. He further said that Dr Arif Alvi has already shown good performance in the last five years in the National Assembly. We hope that after success in presidential election, he will take all the provinces on board, the CM said. Meanwhile, a media report claimed that Interior Minister Fawad Chaudhry had recommended the name of Aitzaz from the opposition in a bid to make a competitive presidential poll. After the PPP suggested the name of its Co-Chairman Asif Ali Zardari for the race, Chaudhry asked the opposition to nominate Aitzaz against PTI’s Alvi, the reports added. A 50-minute meeting was held between Khursheed Shah, Zardari and Aitzaz in which the PPP’s presidential nominee had made it clear that he would not withdraw from his candidature once his name is finalised, according to reports.